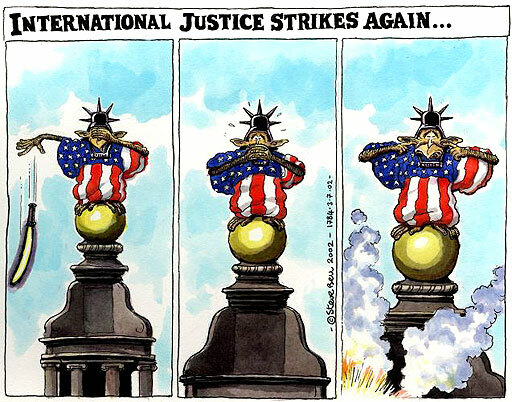 And, at the same time, the US refuses to join in with the new International Tribune for justice against genocide. Methinks they do protest too much. Everyone else thinks the US have no guts or commonsense, or merely want to protect Henry Kissinger. US military officials in Afghanistan have refused to apologise following the mistaken bombing of an Afghan wedding party on Monday which killed at least 30 people, insisting that aircraft had come under sustained and hostile fire. The incident prompted the Afghan president, Hamid Karzai, to summon US military chiefs to his office and demand "all necessary measures" be taken "not to harm innocent Afghan civilians". Afghans claim the wedding guests, who were celebrating near Deh Rawud village, in the mountainous province of Oruzgan, north of Kandahar, had been firing into the air - a Pashtun wedding tradition - when American planes struck. But a US spokesman claimed yesterday that the shooting was "not consistent" with a wedding, saying that the planes had come under attack. "Normally when you think of celebratory fire... it's random, it's sprayed, it's not directed at a specific target," said Colonel Roger King at the US airbase at Bagram. "In this instance, the people on board the aircraft felt that the weapons were tracking them and were [trying] to engage them." The US planes - including a B-52 bomber and an AC-130 helicopter gunship - dropped seven 2,000lb bombs, he added. His unapologetic tone, after one of the worst blunders of the US-led coalition's nine-month war in Afghanistan will infuriate locals, who said most of the dead were women and children. At least 40 others were injured. Last night a US soldier was shot in the foot as an American military convoy returning from the hospital in Kandahar where wedding party victims were being treated came under fire. Col King said the wounded soldier was taken to the US base at Kandahar airport. Afghans travelling with the convoy returned fire but it was not known if they hit any targets. In Washington, the defence secretary, Donald Rumsfeld, said of the bombing that any loss of innocent lives was a tragedy, but said he would not know what had happened until the Afghan and US investigators had reported. "I read in the paper there was a wedding," Mr Rumsfeld said. "I just don't know the facts." US troops appear to have been carrying out a major search for Mullah Omar, the Taliban's fugitive leader. The Afghan foreign minister, Abdullah Abdullah, said that 40 people, all civilians, had died, and that a further 100 were wounded. "In one village, there was a wedding party... a whole family of 25 people. No single person was left alive. This is the extent of the damage," he said. Raaz Mohammad, an official at the Oruzgan governor's office in the provincial capital, Tarin Kowt, also put the death toll as high as 40. The Pentagon has admitted that one of its bombs was "errant" and missed the target, but has refused to confirm that a missile hit the wedding party. American confusion is compounded by the fact that it is unclear which plane was involved. The Pentagon confirmed that a B-52 bomber did drop seven "precision guided weapons" on a cave complex, one of which missed the target. But the US claims this hit an empty hillside. That still leaves questions about the AC-130 gunship that returned what was claimed to be anti-aircraft fire. Mr Rumsfeld said he knew of no casualties, other than four "young people" brought by their father to a US base, who were then helicoptered to Kandahar for treatment. He did hint that al-Qaida training manuals gave advice on how to discredit the US in situations like this but added: "I have no reason to believe that is the case this time." Colonel King said the incident occurred during an operation to track down wanted Taliban or al-Qaida personnel, arms and documents. He said: "The US government extends its deepest sympathies to those who may have lost loved ones or who may have suffered any injuries. Coalition military forces take extraordinary measures to protect against civilian casualties." US forces killed 15 people in the same province in January in a firefight which they later admitted was "ill-advised".